This is classic English comfort food at its best! 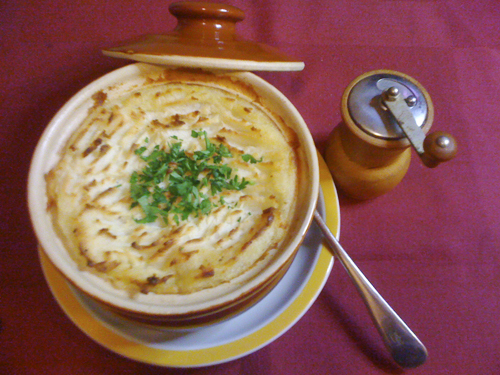 Traditionally, a “Shepherd’s Pie” was made with ground lamb, and a “Cottage Pie”was made with beef. Nowadays, you can pretty much use whatever ground meat you fancy, lamb, beef or even turkey. And as we did not have a photo of a Shepherd’s Pie available, what did we do? Well, I made a Shepherd’s Pie over the weekend and once again, pulled out my trusty iPhone and took a picture! Cook the potatoes in salted, boiling water until tender (about 10 – 15 minutes). While they are cooking, sauté the onion and garlic with a little olive oil in a large skillet or saucepan. Add in the carrot (and some Celery, if you like) and then the ground meat and cook until lightly brown. Season with salt & pepper, Worcestershire sauce and a spoonful of Mustard to give it a slight “bite.” Sprinkle in a little flour and cook for a minute or so until the fat and juices have absorbed the flour. Then add a little chicken stock (and a dash of Red Wine, if you like.) Let the gravy thicken and finally add in a good handful of frozen peas. You could also add some sliced Mushrooms. Pour the meat mixture (which should be nice and thick) into a deep ovenproof dish and leave to cool for a few minutes before adding the mashed potato – this helps to prevent the potato from sinking. While the meat mixture cools, drain the potatoes and put them back into the hot saucepan. Add a good amount of Butter, Salt & Pepper and a dash of either Milkor Cream. Mash the potatoes until smooth & creamy but not too loose. Cover the meat mixture with the mashed potatoes and bake in a hot oven (about 400 degrees) for about 20 – 30 minutes or until the top is golden brown. For a“Cumberland Pie,” add a layer of grated Cheesemixed with some Breadcrumbs on top of the mashed potato.